Never understatement the power of simple food, like good ol’ homemade broth. I can’t even begin to count the number of times that a humble jar of homemade broth, stocked away in my freezer, has saved my failed dinner plans (hello, last-minute soup and biscuits!). 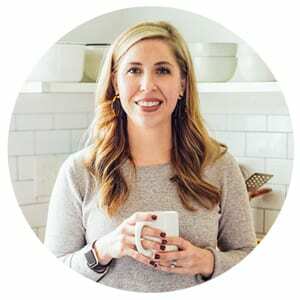 Yep, failed dinner plans even happen to a meal planner extraordinaire. 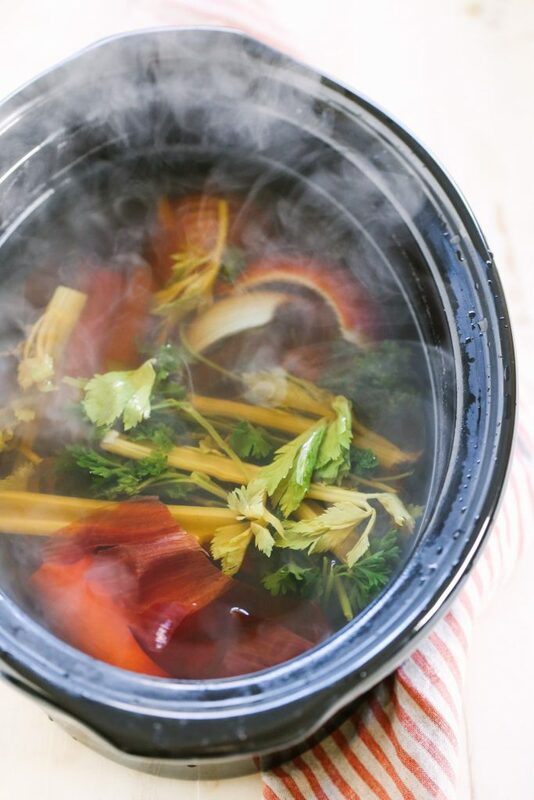 I feel very strongly about the importance of stocking a real food kitchen (actually, the freezer…my best friend when it comes to batch cooking) with homemade broth, whether it’s made from chicken bones, beef bones, or a scrappy pile of veggies. I believe making homemade broth is the single most important kitchen skill a home cook can learn when starting out on a real food journey. Why? 1. Homemade broth enhances flavor. Homemade broth provides an amazing flavor (and additional nourishing benefits) to simple homemade meals like beans, rice, and soup. It’s amazing how the addition of broth to a simple meal, like soup, can really up the flavor factor, which means you don’t need many extra ingredients to enjoy a flavorful dish. 2. Homemade broth is a hands-off food. Homemade broth doesn’t require any extra chopping or stirring! The most time-consuming task of making homemade broth is just straining the broth from the “lifeless” veggies. That’s it! 3. Homemade broth is a budget-friendly food. Homemade broth is basically made from scrap pieces of food, like bones and veggies. Food that most of us would throw away in the garbage. It’s pretty amazing that garbage-destined food can be turned into a beautiful, nourishing, flavorful, and multi-purpose liquid. When it comes to making and stocking broth, I personally stick with two types of homemade broth due to the accessibility of ingredients: chicken and veggie. While I love making homemade chicken broth, I don’t always have enough chicken bones saved up in a week to make enough broth at the rate we consume this liquid gold. That, my friend, is when vegetable broth saves the day (or soup). 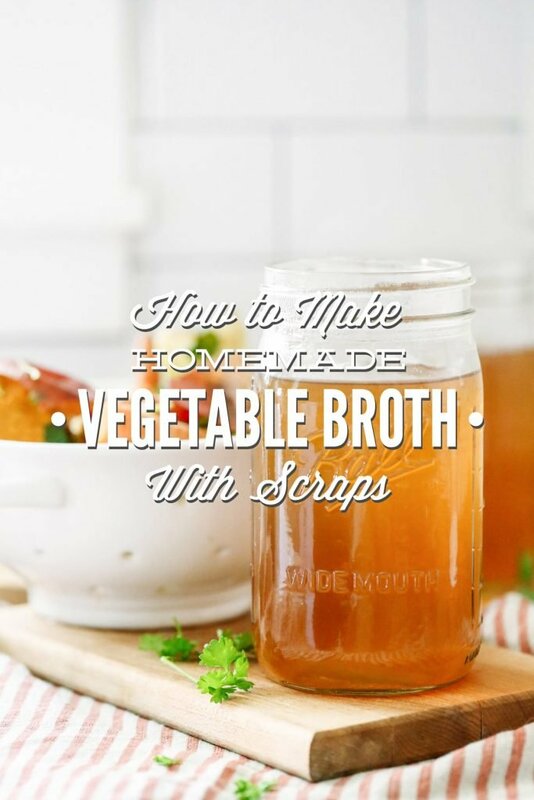 Homemade vegetable broth is made with scrap ingredients, much like chicken broth which is made with scrap chicken bones. The very scraps that I formerly threw away after chopping vegetables or herbs: onion peels, garlic ends, carrot tips and peels, celery leaves, mushroom stems, and even the stems of fresh herbs. Thanks to the scrappy nature of vegetable broth, and since I’m always cutting vegetables and have leftover pieces, it’s easy to amass the amount of vegetable scraps needed to make homemade broth on a weekly basis. 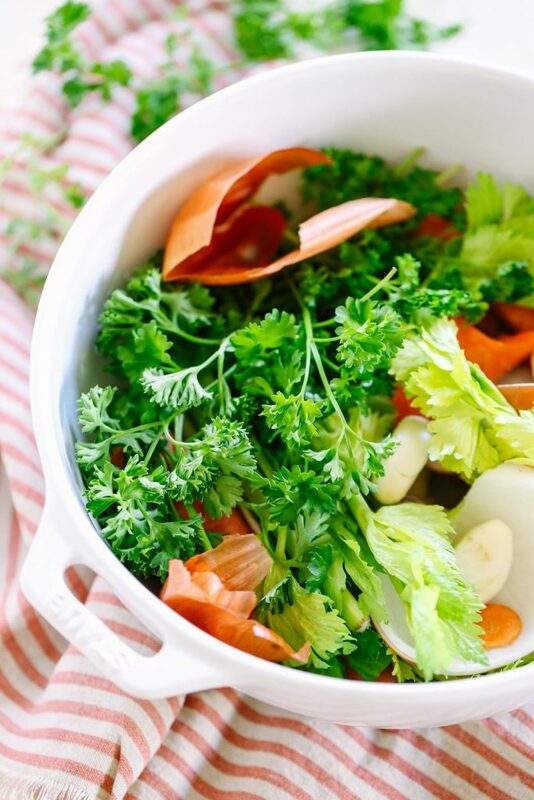 If you haven’t made homemade vegetable broth before, you’re in for a treat with today’s recipe, because it’s just about the easiest and cheapest homemade broth ever made. 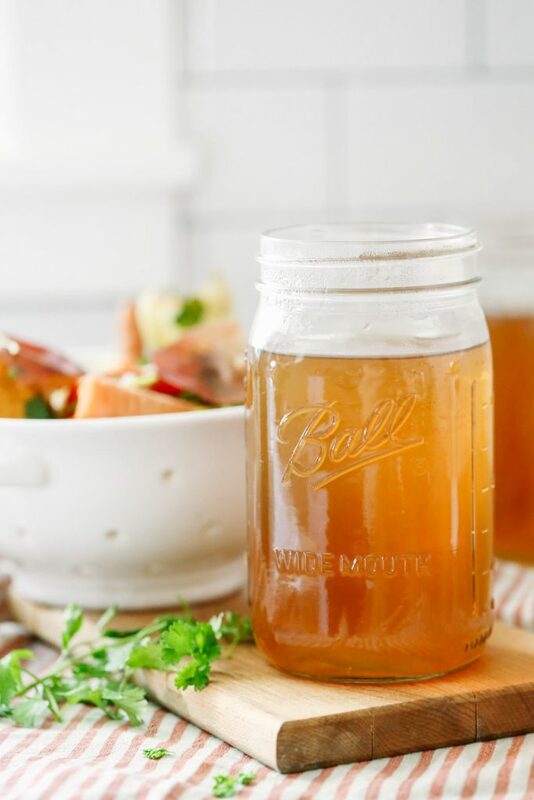 In fact, there’s absolutely no way to mess up this recipe, so whether you’re an experienced real foodie or just starting out on this journey, I promise you’ll experience broth success, instantly, using this recipe. Once you see just how easy and affordable it is to make homemade vegetable broth, and the amazing flavor this broth adds to soups, rice, and beans, you’ll be addicted to stocking your freezer with this liquid gold. Addicted in the very best form of the word, of course. I only promote good addictions around here, like chocolate and broth. You can use this broth in any soup recipe that calls for a liquid, which is all soup recipes ;), or to cook beans and rice. 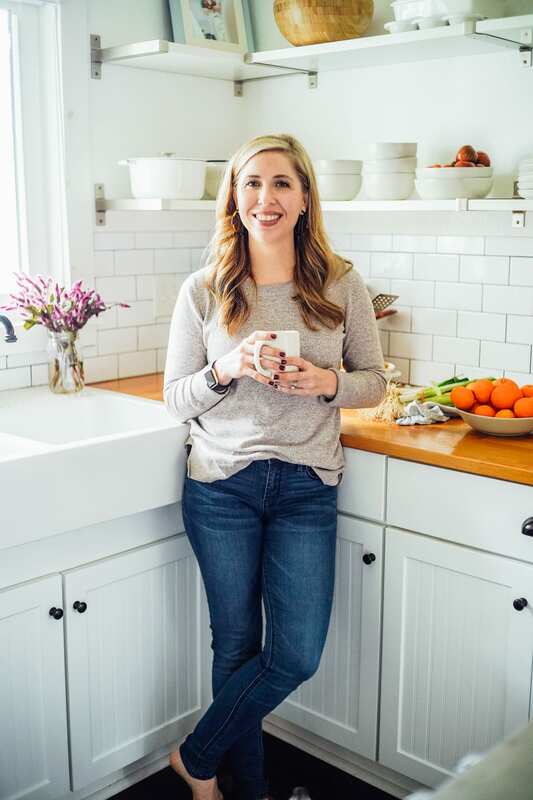 Next week, I’ll be sharing a 30-minute vegetarian soup that uses homemade vegetable broth to add flavor and nutrients to a few very simple ingredients. To make that soup, you’re going to need about 8 cups of homemade vegetable broth (or chicken broth will also work), so your job this week is to start collecting your vegetable scraps (don’t let anything go to waste–just keep filling your veggie scrap bag or container), and then make your first batch of homemade veggie broth in the crock-pot. Once you see just how easy and affordable it is to make homemade vegetable broth, and the amazing flavor this broth adds to soups, rice, and beans, you’ll be addicted to stocking your freezer with this liquid gold. 3-4 cups veggie scraps any size--There's no need to cut anything into a special size. 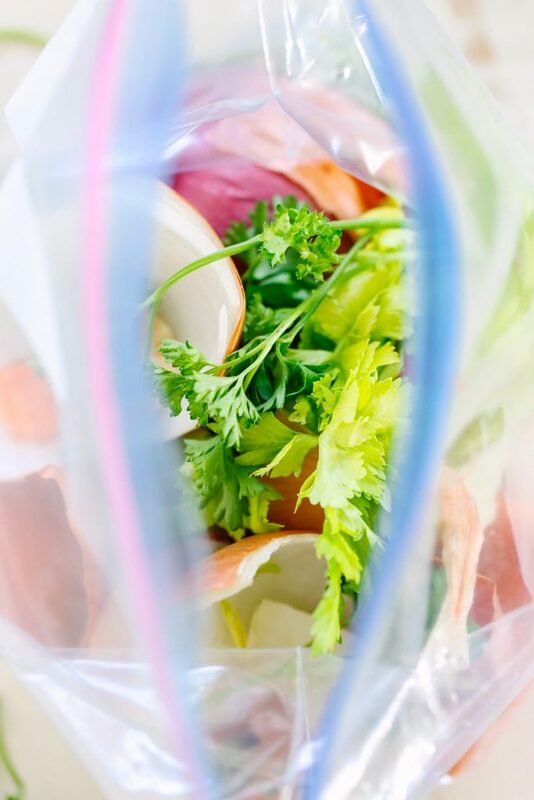 Each time you prepare vegetables, reserve the scraps in a baggie or container. This baggie or container may be kept in the freezer until you have enough scraps (3-4 cups worth) to make broth. 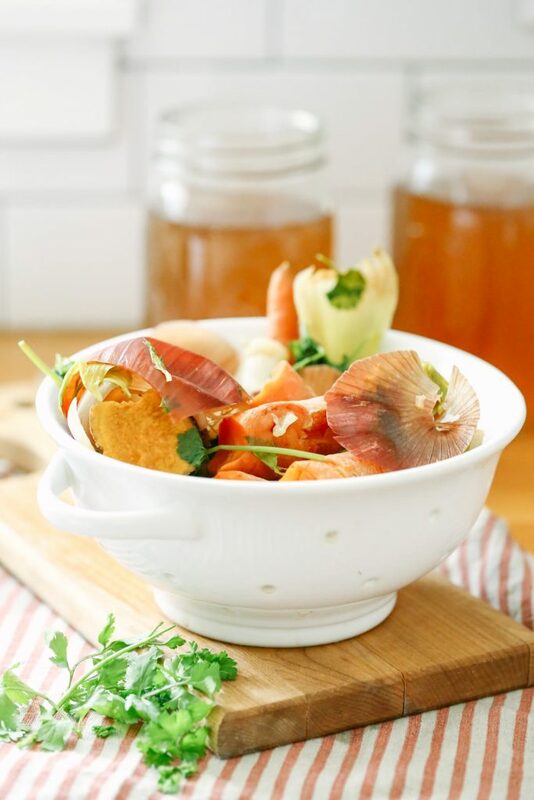 Examples of scraps, include: onion skins, leftover onion slices, mushroom stems, ends of potatoes, celery pieces or leaves, ends of carrots, peeled carrot pieces, garlic ends, bell pepper ends and seeds, leeks, leftover green onions, and squash or zucchini pieces. Add the veggie scraps to your crock-pot, then fill the crock-pot with water (this is about 10 cups of water in my crock-pot). Add the optional add-in ingredients, if using. Cook the broth on low for 10-12 hours, or on high for 4-6 hours. Strain the vegetable broth from the "lifeless" veggies. Discard or compost the veggies. Store the broth in the fridge for up to 1 week, or up to 6 months in the freezer. I freeze my broth in quart-size, wide-mouth mason jars (leave about 2 inches of room at the top of the jar for expansion, and only freeze cooled broth), or ice cube trays (and then store the frozen broth cubes in a baggie). I am so glad you did a post on the often overlooked vegetable broth. As everyone knows, bone broths reign supreme on the web. And bone broths are awesome, however vegetable broths are so great for adding that flavor without using up all of your chicken broth as soon as you make it. Or am I the only one that has that problem? The scraps really do add up fast in the freezer. I remember my mom telling me about this method when I was a teenager. She told me it was common practice among French chefs. Hey Katie, Thank you! Chicken broth is so valuable in our house, and I hate to use all of it in one recipe (oh the feeling! ), but like you mentioned, filling up a bag of scraps and making vegetable broth is so easy and inexpensive! I can totally relate to your comment :). Just to clarify – because it seems too easy 😉 – you basically save everything you’d normally toss in the compost when cutting and cooking veggies? That’s awesome, Samara! I wish we had something like that in our area. 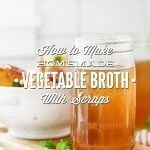 I think you’ll love using the scraps for broth–they make homemade broth so affordable and delicious :). I love being able to use my veggie scraps to make a broth! I’ve made this several times now and freeze it in 1 cup portions. It’s great to have on hand.